"No, I've never heard of anything like this. And I think it's wrong for the spouse of a Justice to get involved in anything like what's happening here. If nothing else, it casts a big shadow on Thomas (assuming he cares). And the Third Branch should not be involved in (overt) politics." I suppose the rancor harbored by what is supposed to an insulated body of government, the judiciary, has stewed for some time and this is but one result. Well before the "State of the Union grimace," Senator Obama was one of the sternest opponents to Alito's confirmation (google it). Fast forward to today, I think the political climate (tea-partiers, birthers, etc.) has emboldened political factions, particularly on the Right, to the extent they'll traverse historically maintained barriers that we would have never dreamed about crossing before. Case in point: the wife of a Supreme Court Justice creating a high-profile tea-party-esque political entity during the height of political turmoil, as if this act has no bearing whatsoever on the appearance of judicial impropriety for her husband. It's not a matter of "can" she do it, it's a matter of "should." Sure, other judges have had wives or husbands who are politically active, but the nature of this organization in this political climate sets it apart from your average run-of-the-mill political activity. In other words, it provides Thomas a chance to do something through his wife that he himself has probably dreamed about doing for quite some time: take a shot at the President. I disagree with my fellow Urban Politico, The Fed, below. I actually think that when you marry a person in that type of position that you should definitely be held to a particular standard, specifically because of the type of person you married. Although she is a private citizen, because of the office her husband holds, he can further his agenda through her actions, without being directly connected. That gives them an unfair advantage. If there are things that HE can't get involved with because of his office, then she shouldn't be able to get involved either, since she is his wife...."and the two shall become 1 flesh." My dad is a preacher too! It brings much unwanted scrutiny to the family. I also disagree with my fellow Urban Politico, The Fed. They got married in 1984 but Mrs. Thomas started her group NOW, not back in 1984 before he was a judge. She didn't even start her group before Citizens United. I bring this up because it puts it in a more important context: that decision allowed for groups like hers to influence elections in a negative way ONLY because of her own husbands decision (well his vote with the majority anyways). I just think it's absolutely against protocol for the Supremes. That's why there has been such a strong reaction because it is unprecedented and I think it's because the SCOTUS is not supposed to be overtly political (in theory). Also, I've seen a lot of analysis talking about how this is going to present conflicts for Justice Thomas in future cases if any of them deal with a company affiliated with his wife's group and HE HAS THE POWER ALONE to recuse himself. What do you think he will do? He ain't recusing himself and we have this conflict of interest that we can't do anything about. That's not what the SCOTUS is about. I'm kinda on the fence! For me this is only an issue because they are conservative. I don't feel I would have the same feelings if it was Sotomayor, and I don't think we would feel as passionately about it. Now CLEARLY if her role would influence his decision in ANNNNYway, then okay, I get that. But should it...eh...not so much. We may not LIKE it, but she is fully within her rights and ethics to do something like this. She is still a 'private citizen,' has no obligations of any kind to anyone (in this context), makes no decisions about anything, and is free to decide, and believe how she wants. I completely understand the position she puts her husband in, but I don't think we want to go down the road of saying...if you decide to be in public office, then not only you, but your FAMILY as to act a certain way. 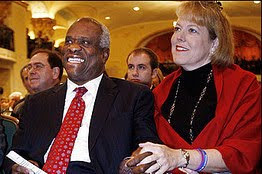 They got married in 1984...she couldn't have known he would be a Supreme Court Justice years later. We don't hold her accountable for the stupid things Thomas does. No court is going to convict her of anything. No one loses their job. No one breaks the law. NOTHING has happened!!! Being a PK, we fought hard to not let my fathers title and job define us (family) or our actions. My mother use to say "I'm NOT the pastor." He was nominated by a conservative, so we know where he lies. I wish we can put aside this charade of judicial impartiality. Heck, we USE it in politics...that IS one of the reasons you vote for who you want because you KNOW, if given the chance, they will put someone in the SCOTUS with similar political views. We either accept this or we have justices selected by other means. I don't know, but in it's current form it is political.